CHICAGO (December 23, 2013) – Focused on better health and greater value through information technology, the HIMSS Foundation and the National eHealth Collaborative announce a merger. Both organizations embrace a similar mission to engage with all stakeholders to drive positive change in healthcare with IT and provide a single, mission-driven voice and focus; NeHC will fold into the HIMSS Foundation. NeHC’s Board of Directors approved the merger in late November, and NeHC members approved the merger in mid-December. The HIMSS Foundation Board of Directors also approved the merger in mid-December. The merger is effective on December 23, 2013. NeHC’s CEO, Kate Berry, will play a leadership role to assist in ensuring a smooth transition of NeHC into HIMSS over the next few months. NeHC was created five years ago by Mike Leavitt when he was Secretary of the Department of Health and Human Services. Operating as an independent, non-profit organization, NeHC has worked closely with the Office of the National Coordinator for Health IT (ONC) as well as other public and private organizations to encourage effective use of health IT. The original five-year cooperative agreement funding from ONC ended in 2013. The creation of the HIMSS Center for Patient- and Family-Centered Care, aligning with HIMSS’s Connected Patient Committee and Community. NeHC’s education programs will be integrated with a NeHC University and Resource Library on HIMSS’s website. NeHC’s health information exchange programs will become part of the HIMSS HIE portfolio. As part of the merger, NeHC members will become HIMSS members. The NeHC Board of Directors will appoint a volunteer advisory committee to help shape the agenda of the new HIMSS Center for Patient- and Family-Centered Care, reinforcing the importance of and commitment to this transformation set of programs. HIMSS is a part of HIMSS WorldWide, a cause-based, global enterprise producing health IT thought leadership, education, events, market research and media services around the world. Founded in 1961, HIMSS WorldWide encompasses more than 52,000 individuals, of which more than two-thirds work in healthcare provider, governmental and not-for-profit organizations across the globe, plus over 600 corporations and 250 not-for-profit partner organizations, that share this cause. HIMSS WorldWide, headquartered in Chicago, serves the global health IT community with additional offices in the United States, Europe, and Asia. Visit www.himss.org for more information. National eHealth Collaborative (NeHC) is a public-private partnership that accelerates effective use of health IT to create a more patient and family centered healthcare system with better outcomes and greater value. NeHC works closely with the Office of the National Coordinator for Health IT in the U.S. Department of Health and Human Services and is led by some of the nation’s most respected thought leaders in healthcare and health IT. NeHC’s primary focus is on encouraging health information exchange, providing tools to support engagement with consumers, and leveraging an education platform and health IT programs with broad stakeholder reach. NeHC brings value to the healthcare community by offering both pragmatic tools to support deployment of health IT and serving as a convener of stature to assist stakeholders in tackling common challenges and developing collaborative solutions. Healthcare is broken. No one disputes that. No one lacks perspective on how to fix it, either. The challenge, though, is disrupting a system that makes more money treating sickness than it does preventing it. Technology and innovation can play a part, but so can flipping the entire care model on its head. For centuries, that has been the lament of the sick, the wounded and the troubled. As advances in modern medicine help people live longer, surviving conditions that in the past would have killed them, more and more people say that every day. Over time, this has placed tremendous strain on the healthcare industry. This is true in all parts of the world — but perhaps nowhere more so than the United States, where healthcare spending will approach $2.8 trillion in 2013 and reports that the yearly rate of increase is falling counts as “good” news. There’s no shortage of ideas about how to fix what the Institute of Medicine deemed the quality chasm back in 2001. The federal government is encouraging providers to use electronic health records (and penalizing those who don’t), requiring a switch to the ICD-10 code set to identify diseases and treatments for billing purposes, establishing state-run health information exchanges to better share patient data, and implementing broad-based healthcare reform aimed at phasing out the lucrative fee-for-service payment model. However well-intended, such initiatives, so far, aren’t yet working. More than one speaker at last week’s MIT Innovations in Healthcare Conference described healthcare in the United States as “embarrassing,” while another half-jokingly thanked the audience for letting its tax dollars fund the care of dual-eligible, frequent-flier patients in Camden, N.J. — one of whom made 113 emergency room visits in a single year. The conference, a joint product of MIT’s Sloan School of Management and its Industrial Liaison Program, covered a wide range of topics, from entrepreneurship and academia’s role in innovation to patient engagement and data analytics. As the event progressed, though, a common theme did emerge — perhaps patients don’t need to see a doctor right away, or even at all, to solve many of their health problems. Dr. Jeffrey Brenner, executive director and co-founder of the Camden Coalition of Healthcare Providers, says healthcare is at its “Blockbuster Video moment.” The industry faces a Netflix-like disruption. Healthcare can either point to patients who begrudgingly continue to visit the nation’s volume-based, fee-for-service hospitals and call them satisfied, much like customers wandering the aisles of a video store on a weekend night, or it can embrace change before the bubble bursts. Brenner’s healthcare delivery organization aims to do nothing more than bend the cost curve in one of the nation’s poorest cities. (He’s the one who thanked taxpayers for their support.) A 9-year analysis of the city’s three hospitals ERs showed that most visits involved low-income mothers and their children in need of care but unable to get appointments with a physician. The hospitals happily oblige; treating head colds is more profitable and easier than addressing more complicated conditions, as there are no referrals or consultations to manage. Healthcare’s bubble stems from an industry with too many hospital beds, too many machines doing too many unnecessary tests, and too many specialists earning too much money and enjoying too much influence, Brenner says. There’s isn’t a shortage of doctors, he continues, but, rather, too many. As Brenner sees it, healthcare needs half as many doctors, twice as many nurses and three times as many health coaches. Rushika Fernandopulle, co-founder and CEO of Iora Health, agrees. Iora Health, with practices in four states, emphasizes the importance of team-based care. Each day begins with a practice-wide huddle; a doctor may lead one day, the secretary the next. There are no offices or “reserved” parking spaces. Practices have up to four times as many health coaches as physicians. Empathy drives decisions; physicians, nurses and caregivers are essentially asked to treat each patient like their own mother, Fernandopulle says. Faced with the threat of strikes in the early 1990s, Kaiser responded by creating a labor-management partnership through which employees help determine performance-based outcomes. Such empowerment convinces employees that they are, in fact, part of the solution, August says. Once such solution: The proactive office encounter, in which a receptionist analyzes patients’ records while they wait for an appointment and schedules them for preventive screenings they would otherwise miss. The process is admittedly one filled with fear and failure, August says — understandably, some receptionists were reluctant to tell unknowing patients they needed cancer screenings. That’s all the more reason to make sure everyone in the office goes through the disruptive process together. It is, indeed, a disruptive process. Healthcare today approaches each office visit with what Brenner calls a “one-size-fits-all hammer” — whether an office visit is an annual physical or a post-operation follow-up, it’s unlikely to last more than 15 minutes. Clearly, this doesn’t serve patient’s needs. Fixing this means transferring risk to a clinical body that’s help accountable for patient care, Master continues. This, in turn, means redesigning the healthcare delivery system into one with interdisciplinary clinical teams who provide care in multiple locations; individualized care plans that promote home and community care; an attitude that views “primary care” as a concept, not a facility, and 24-7 availability in all settings, at all times. Partners HealthCare is another such system, having rolled out an iPad app that asks patients a variety of health, wellness and quality of life questions. Patients see the data as a gauge, like a speedometer, highlighting their values or scores and comparing them to the norm. On the back end, the data is normalized, helping Partners quantify, trend, aggregate and compare data sets, says Dr. Gary L. Gottlieb, president and CEO of Partners HealthCare. But most of modern medicine is defined by the “locked knowledge base,” with information of all kinds — training, educational, clinical and financial — kept in silos, says Lincoln C. Chen, president of the China Medical Board. With no link between knowledge and the training cost associated with gaining it, restrictions on task shifting remain in place. That means receptionists can’t recommend a preventive screening, health coaches can’t call a patient at home and stitches cost more than $500 apiece. Until this change happens, Chen says, patients will continue to say, “I need to see a doctor” — and the healthcare system will intuitively respond without acknowledging that each appointment only exacerbates the imbalances in the system. Panic about high health insurance premiums. Fears about high-cost health-care providers being cut out of health plan networks. Worries that the health plans now available through health insurance exchanges won’t cover the care that patients need.Welcome to the rollout of Obamacare….right? Actually, with the exception of the new health insurance exchanges, all of the phenomena described above have a long history. Similar concerns were voiced loudly in the late 1980s and 1990s, when “managed care” in health insurance became a dominant force on the health care and health insurance landscape. What’s amazing to people who lived through both of these eras—then and now—is how little has changed. Health insurance premiums are relatively high now, as then, in large part because the prices and costs in U.S. health care are extraordinarily high.Some health-care providers are being cut out of health plan networks because they are even pricier than others–with little if any data to back up their claims that they are providing care of superior quality to their lower-cost peers. Consumers, meanwhile, are confused. Although some are embracing the lower-cost “narrow networks” offered by health plans, others worry that lower-cost providers won’t provide the highest quality. The same consumers who might buy designer duds at outlet malls somehow feel jittery about discount health care. Helping all of us understand what’s driving high health care costs–and making the best choices about health insurance and health care as a result–is why we need more transparency in the prices, costs and quality of health care. Here are four things to know about the issue. “Transparency” means clear and accurate information, and having it is the key to an effectively functioning market. If there is information “asymmetry” in a given market–for example, if the seller knows more about the quality of a good or service than a buyer–the buyer may end up paying more for a product than is optimal (think about buying a used car as an example). The situation would be even worse if the buyer didn’t know what the price was and only found it later, when the bill arrived. Yet that’s the way much of the U.S. health care market works now–and as a result, patients or consumers and purchasers, such as health plans and large employers, often end up paying very high prices for health care of uncertain quality. U.S. prices for health care are far higher than prices in all other countries. “Prices are–when you look at the real numbers–the overwhelming difference between us and them,” writes George Halvorson, the chairman and former CEO of Kaiser Permanente, in a forthcoming book, Don’t Let Healthcare Bankrupt America: Strategies for Financial Survival. 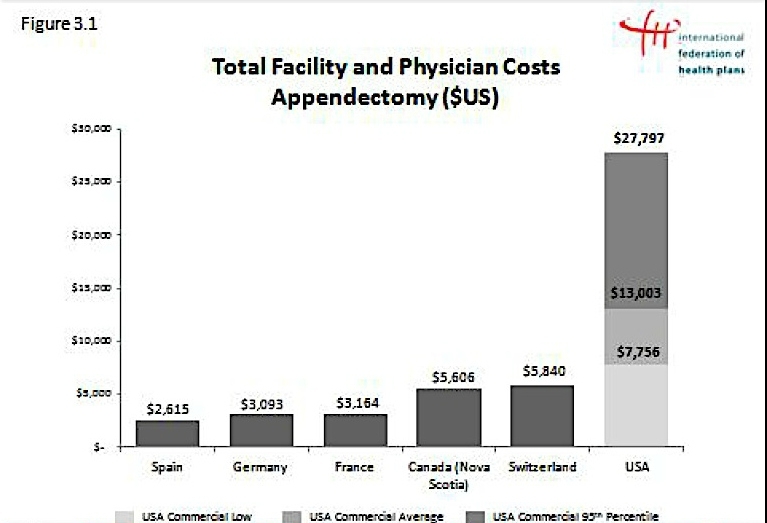 Consider a simple appendectomy, for which many Europeans pay about $3,000, versus more than double that in the U.S.; even more startling, some U.S. hospitals and health systems charge nine times as much (see graphic below). What’s more, it can be next to impossible for consumers to find out about prices ahead of time, with a few notable exceptions. In California, for example, hospitals by law now have to disclose prices for the 25 most common outpatient services or procedures. Despite what many U.S. consumers appear to believe–that higher cost institutions offer higher quality–there is no automatic correlation between the two. One study showed that hospitals that charged the most for sepsis care actually had the highest sepsis death rates (T. Lagu et al, Archives of Internal Medicine, 2011). Higher-cost institutions that imply that they must charge more than others often lack the quality data to back up their claims. A recent Washington Post story noted that Seattle Children’s Hospital was omitted from health plans competing in the Washington state health insurance exchange in large part because of its higher costs for providing care that could be purchased less expensively elsewhere. The story pointed out that a pediatric appendectomy at Children’s costs $23,000, versus $14,100 at a nearby community hospital. When consumers are given clear information about costs and quality, they can make better choices about their health care. Judith Hibbard of the University of Oregon and colleagues have shown that presenting cost data alongside easy-to-interpret quality information–and highlighting high-value options–improved the likelihood that consumers would choose those options. And thanks to advances in quality reporting spurred in part by the Robert Wood Johnson Foundation’s Aligning Forces for Quality initiative, consumers no longer need to make many health care purchasing decisions in a quality vacuum. For example, the Foundation’s Comparing Health Care Quality: A National Directory, is an interactive tool listing 208 national, state and local public reports that can help consumers find reliable health care in their communities. As Sy Syms, a pioneering New York discount retailer who died in 2009, used to say in television commercials for his chain of stores, “An educated consumer is our best customer.” Transparency can help make all of us the kind of savvy health care shoppers of whom Syms–and maybe his doctor–would have been proud. Don’t miss our first #FirstFriday Google+ Hangout! Panelists will talk about transparency in health care. Submit your own questions for the expert panel to answer during the live discussion, through Twitter at @RWJF by tagging your questions with #PriceTransparency. Check back to watch the live event on this page. Visit our Transparency in Health Care Prices topic page.